Recently I've published one cool plugin named Random featured post, mp3 player + share button, the 3 in one plugin and this is the official page. Since this is my first Wordpress plugin so I will actively listen to your suggestion or feedback at most. One well branded Honda slogan "The Power of Dreams" really inspires me on this plugin creation. Well I do not have any official education about programming or web development, and I'm completely not understanding PHP well. But the dream has led me to creation of this quite excellent result. Multi Function in one package, the 3 in one. The widget floats at the top or bottom of page and it's not annoying with minimal design but stylish. Random posts can be chosen from desired categories. You can play Mp3 on your wordpress sites easily. Ever tried to multiply your affiliate or find a new marketing strategy? Well, this plugin has a powerful feature to do so. You can deliver your persuassive demo or presentation into an Mp3 file and let this plugin works for You. Download randompost_mp3player_sharebutton.zip and unzip it to your plugin folder /wp-content/plugins/. 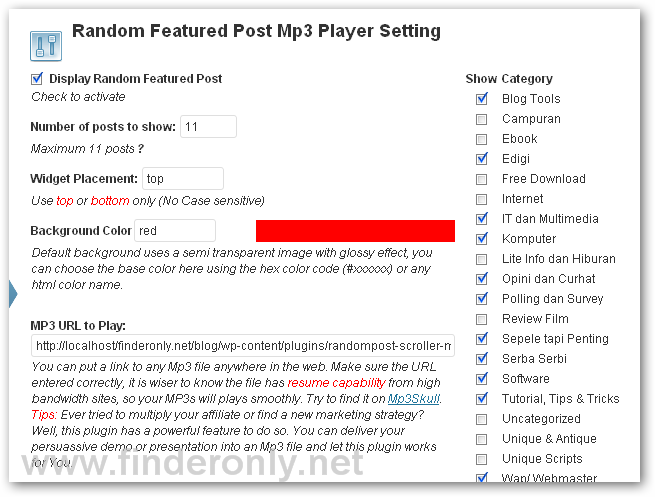 Activate plugin "Random Posts, Mp3 Player + ShareButton" from Plugins menu » Installed Plugins. Go to the "Random Posts, Mp3 Player + ShareButton" options in your dashboard check "Display Random Featured Post", define number of posts to show, widget placement, background color and categories you would like posts to be randomly selected. * This plugin was created and has been tested in the latest php and mysql version. It's working fine using xampp 1.8.0, PHP Version 5.4.4, and PMA 3.5.2. If you find the random post not shows please check your server version. * This version is stable, but I'm still developing this plugin. New feature will be added in the next version like allowing user to choose link background and analytic option for the add this button. * CSS uses ob_gzhandler compression to minimize size and enhance the performance too, hope your server support it. I'm actively listening to your feedback and fixing problems, any suggestions are kindly welcome. Please let me know if you like the plugin too! Please submit your comments or suggestions regarding to this plugin, I'll add it to this section in the future. Thank you for anyone use this plugin, hope you all like it, has good use for you as well as entertaining your visitors. Don't forget to "LIKE" this page and my Facebook Fan Page as your appreciation as well as to notify for the latest update to your wall. Please use it wisely, licence, copyrights and its distribution statement are include in the plugin package.